Elevate your bed and your available storage to new heights with these Adjustable Bed Risers. Simply screw the base plate into the bottom of the box spring with the provided screws then screw in the leg stem to create up to 35 cubic feet of storage space under your bed. A patented glide allows for easy rotation of the box spring. Adjustable Bed Risers Features Creates up to 35 cubic feet of storage space under the bed. Depth of frame of box spring must be at least 2 3/4 inches to mount properly. Patented glide allows for easy rotation of box spring. Fits any bed size including heart shaped and odd sizes. Made from High impact polypropylene making it virtually indestructible. Sizes and Set Quantities For Bed Legs: 7 or 10 inch Twin Bed Risers Come in Sets of 6. 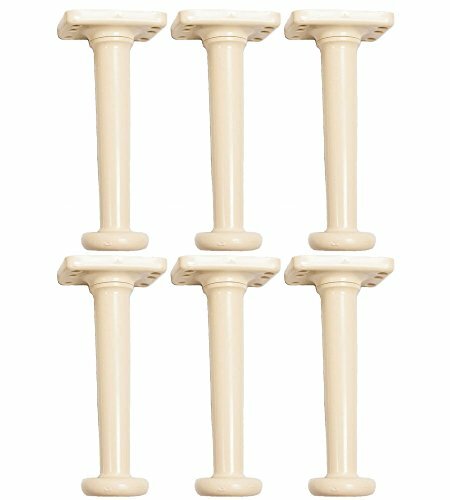 7 or 10 inch Queen and Full Bed Risers Sets of 9. 7 or 10 inch King Bed Risers Come Sets of 12. Creates up to 35 cubic feet of storage space under the bed. Depth of frame of box spring must be at least 2 3/4 inches to mount properly. Patented glide allows for easy rotation of box spring. Fits any bed size including heart shaped and odd sizes. Made from High impact polypropylene making it virtually indestructible. If you have any questions about this product by Universal Bedlegs Inc., contact us by completing and submitting the form below. If you are looking for a specif part number, please include it with your message.